On mouse-over, overflow-y : scroll which displays vertical scroll if content is more. To hide scroll bar, the width of parent element (sidebar) is kept smaller than sidebaritem with overflow :hidden. 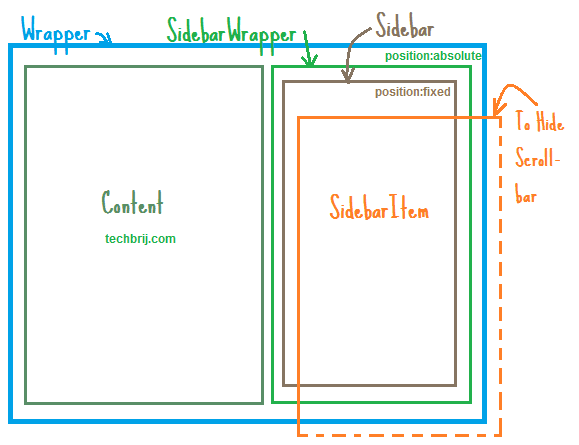 Now you might think, what is role of sidebarwrapper? If you use sidebar directly you have to define top and right position. Suppose you set right: 0 then on different resolution, it’s always sticked with right side even content appears in middle. To keep sidebar along with content, sidebarwrapper is used with position: absolute and sidebar is placed in it with fixed position without right declaration. but it is very annoying.